There comes a time in every kitchens life when it needs an update. The color choices that were made years ago no longer fit the style of the home or home owner and it becomes time to bring it into the modern age. 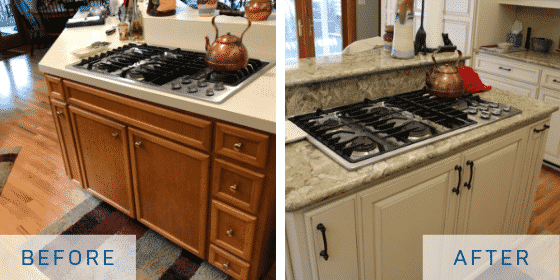 A complete kitchen remodel can be costly and takes a lot of time to complete so the solution usually comes down to two options: Reface or Refinish. 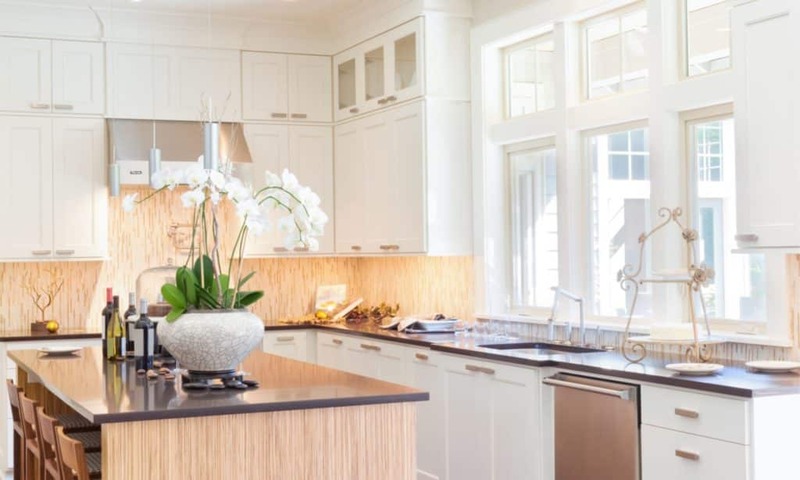 Both options come at a much cheaper cost to remodeling and offer a faster turn around resulting in a kitchen that looks brand new. When making the decision as to whether you want to Reface or Refinish here are some key things to consider. Refacing cabinets keeps the existing cabinet box but builts it out slightly and brand new doors are put on. Custom cabinet doors and drawer fronts are finished at the factory before being shipped out and installed at the jobsite. Factory finished cabinets mean that during the fabrication and finishing process a lacquer is applied and baked into the doors. This way of finishing results in a durable and hard surface resistant to bubbling and unlikely to chip for years. On top of that there is usually another layer of top coat added to help resist wear. A factory finished cabinet also typically comes with a warranty ensuring that if for some reason those durable finishes fail and there is chipping or warping they will replace or fix the problem. 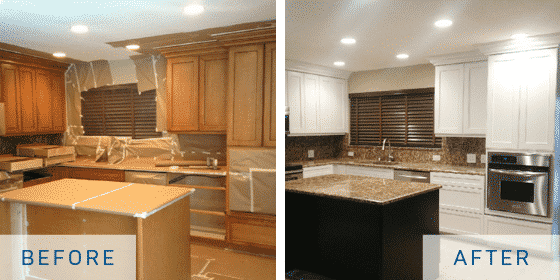 Refacing takes about a week to finish making it much faster than remodeling projects. The average cost of refacing cabinets is between $14,000 and $18,000 for a medium sized, and relatively straight forward, kitchen. To learn more, check out our blog breaking down the cost of kitchen cabinet refacing. The refinishing process typically means that the existing cabinet fronts are sanded down repainted and put back where they were. The alternative to factory finish is on site finishing which means that either a contractor or an eager hands-on homeowner will choose to paint the doors themselves. The type of paint that can be bought in a retail store is almost definitely not the right paint for cabinets. The natural oils in our skin break down most acrylic paints over a period of time so if the wrong paint is used then a year or so down the line it will begin to rub off or chip around the most used sections of the cabinet. Home applied paint also typically is water or oil based and drys through evaporation rather than being baked on. This results in paint that is susceptible to bubbles, warp, and chipping not long after the drying process is finished. Letting a contactor come in and paint your cabinets may save money but if a year down the road they start to break down and chip there is no guarantee that that contactor will still be around to be held accountable for the damage and you might be paying to have it finished again. Refinishing projects can be done in a day maybe two depending on the size of the kitchen. Refinishing cabinets will cost between $2,000-$4,000 making it the cheapest option. Every project is personal to the owner and user of the kitchen, what is important to some may not be to others. Always take into consideration what will work for you and how to enlist the help you need to make your dreams a reality. Know what’s right for your project andr ready to start today? Give us a call we look forward to hearing from you!